Admiral Ackbar: "What if this new Death Star is a trap?" General Madine: "Don't worry, we have a map." Lando Calrissian: "Then destroying it will be a snap!" Mon Mothma: "After this meeting, I'll need a map." 7754 Home One Mon Calamari Star Cruiser is an Episode VI: Return of the Jedi set released in 2009. It includes an A-wing and the Home One Briefing room. It was the winner of the LEGO Star Wars 2009 Fan's Choice Competition. The set includes the only appearances to date of Mon Mothma, General Madine, and Mon Calamari Officer minifigures. It also marks the first appearance of Admiral Ackbar, and includes a new Lando Calrissian and a Green-Squadron A-Wing pilot that is unique to this set. Currently, all minifigures except the A-Wing Pilot are exclusive to this set, though General Madine reappeared in slightly altered form in LEGO Star Wars Collectible Display Set 3. This is the first mainstream set to include Admiral Ackbar, the other being a magnet set. In 2013 he appeared in the A-Wing (2013 set). This is first set to include a green A-Wing. This is a description taken from LEGO.com. Please do not modify it. (visit this item's product page) Prepare to attack the Death Star! Aboard the Mon Calamari Star Cruiser Home One, the Rebel Alliance plans its final assault against the Empire’s second Death Star. Voted for by fans to celebrate the 10th anniversary of LEGO® Star Wars, the famous Rebel flagship features a command center and briefing room with Death Star “hologram,” a launch and repair hangar, a Green Squadron A-wing starfighter with removable engine and firing flick-missiles, and the first-ever LEGO minifigures of Admiral Ackbar, Rebel leader Mon Mothma, General Lando Calrissian, General Madine, a Mon Calamari officer and a Green Squadron A-wing pilot. Move the levers and gears to prepare the A-wing for takeoff or to rotate Admiral Ackbar’s command chair! Includes 6 minifigures: Admiral Ackbar, MonMothma, General Lando Calrissian, General Madine, a Mon Calamari officer and a Green Squadron A-wing pilot! 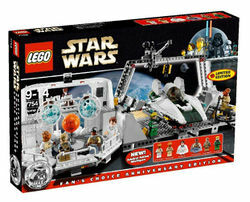 Set features Mon Calamari command center, repair hangar and an A-wing starfighter! Command center and repair hanger measure a combined 17 inches (43.2cm) long and 9 inches (22.9cm) wide! Facts about "7754 Home One Mon Calamari Star Cruiser"
Prepare to attack the Death Star! This page was last edited on 9 January 2016, at 21:54.